Marines Corps. Lance Corporal Arturo Weber made the decision to enlist in the military shortly after the September 11, 2001 terrorist attacks. 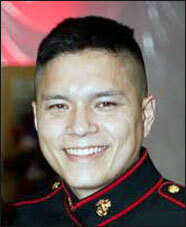 He joined the Marine Corps shortly after graduating high school in Hamilton City, California. On April 12, 2007, Lance Corporal Weber, then an infantryman assigned to 2nd Battalion, 7th Marines, Gulf Company, was critically wounded when he was struck by hostile small-arms fire while on patrol in the Al Anbar province outside of Fallujah, Iraq. He was wearing bullet-resistant protection for his groin and chest, but rounds struck him in the abdomen. He was also shot in the hand. He was treated at a field hospital, then transported to Baghdad, where he was stabilized for a flight to Landstuhl Regional Medical Center in Germany. From there he was flown to Bethesda Naval Hospital in Maryland where he was in critical condition on life support. He arrived there on his 20th birthday. Lance Corporal Weber underwent nearly 50 surgical procedures at Bethesda, and another 30 at the Naval Medical Center in San Diego. He has a 100% disability rating from the Department of Veterans Affairs. Among the commendations awarded to Lance Corporal Weber were the Purple Heart, Combat Action Ribbon, Sea Service Deployment Ribbon, Iraq Campaign Medal with Campaign Star, Global War on Terrorism Service Medal, Navy Unit Commendation, and the Rifle Sharpshooter Badge. Building Homes for Heroes will be gifting Lance Corporal Weber and his wife Mary My-Trinh Tran a home in Hawthorne, California in 2016. Lance Corporal Weber and wife Mary My-Trihn-Tran. Lance Corporal Arturo Weber at the Naval Medical Center in San Diego. Lance Corporal Weber and his wife would like to reside in Hawthorne, California.